Delicious chicken pie. Prepare the filling ahead, then add the pastry and bake to feed a crowd. Chop each chicken thigh into about 12 pieces and toss with the flour. Melt half the butter in a large frying pan and sauté the leeks for about 10 minutes or until softened. Tip into a bowl and set aside. Melt half the remaining butter in the same pan and sauté half the chicken pieces until golden and barely cooked. Add to the bowl with the leeks. Repeat with the rest of the butter and chicken. Mix the chicken and leeks together along with the parsley. Return half of the mixture to the pan, add half the milk and half the cream and bubble for 5 minutes. Transfer to a clean bowl and repeat with the rest of the chicken, cream and milk. Combine the batches, check the seasoning and cool. 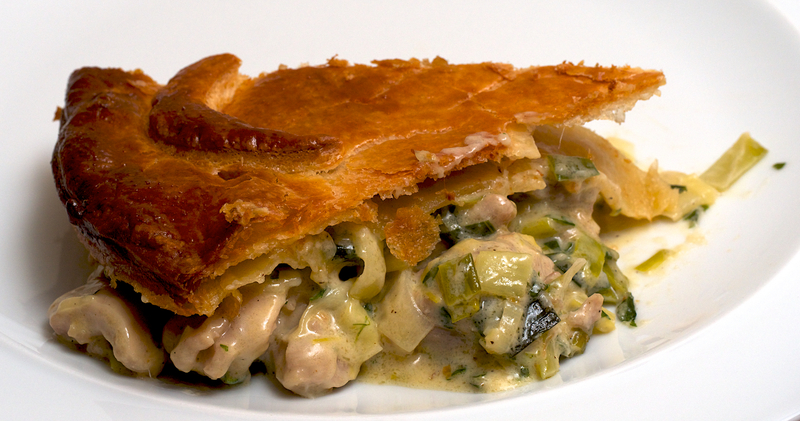 Put the chicken filling into a 1.5 litre pie dish and cover with the puff pastry or mashed potato. Brush with the beaten egg and bake for 25-30 minutes or until golden. Wine Suggestion: We are big fans of good Bordeaux white wine and this dish works well with the balance of flavours of oaked Semillon and Sauvignon Blanc. The toasty buttery character complements the flavours and the clean and fresh texture balances any richness of the dish. Look out for some of the smaller Chateau that are up and coming like Chateau Bouscaut; the 2010 worked a treat here. That looks like a perfect pie!